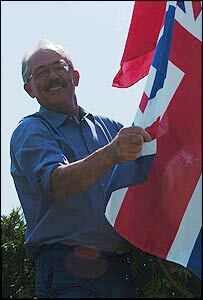 Jacques Flambard proudly flies a Union Jack outside his home. Sixty years ago to the day, British soldiers liberated his Normandy village, Blainville-sur-Orne, from Nazi occupation. And despite losing a brother in the Allied bombing, he still thanks the UK and the US for his freedom. 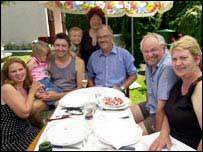 On Sunday he celebrated 60 years since D-Day, "le debarquement", with a family barbecue in his garden. The liberation of Blainville-sur-Orne came one day later, on 7 June 1944, as fears increased the presence of German troops would increase Allied air attacks on the village. He said: "When the English came here, the military gave chocolate to the children and corned beef to the French people, who gave butter and fresh produce in return." Everyone celebrated, he said, except for one man who helped the Germans and earned the nickname "Collabo". He was forced to leave the town and was nearly killed when he returned briefly three years later. The change in lifestyle after liberation was drastic, Mr Flambard said. "Before you couldn't listen to the radio, you couldn't leave home after 10pm. "But after the British came, we listened to the BBC on the radio and had more freedom. "Communications between Normandy towns improved so trade got better." The joy in the Flambard family was shattered by the news that the eldest son, 22, was killed in a bombing in Caen. But any residual anger about events in the war is directed at the Germans. He said: "It's very difficult for my generation to accept. Of course it's important to have relations between the British, French and Germans. "Young people should live in peace but older German people keep bad feelings. "Europe is important but the UK, US and Canada is more important." At this point, Mr Flambard's son Fabien, 36, intervened and said: "Not me, I think it's important to live in the same Europe." His father made friends with a British D-Day veteran, Bryan Balsom, 15 years ago, when he came to the village for an anniversary event and needed somewhere to sleep. Mr Balsom was meant to return for the 60-year events but was too ill to travel. The passage of time means fewer veterans are coming each year, but the memory of their achievement will live on in the Flambard dynasty for generations.